Many people have asked for a monthly version of our budget spreadsheet that they can use to keep track of their budget changes each month. It's a great idea to do this and we'll discuss why below, as well as provide you with a spreadsheet download of a free monthly budget worksheet. If you know anything about accounting then you'll know that there are two ways to account for income and expenses. They are called the cash basis and the accrual basis. In the cash basis, actual income and expenses are calculated each month and you typically have either a large surplus or deficit. Cash basis is often the form of accounting used to prepare taxes. The other method is called the accrual basis. In accrual accounting, income and expenses are allocated across the period in which they represent, not in the period they are incurred. For example, in accrual accounting, an annual real estate tax that was paid in December would not be recorded in December, but would be divided across all of the months for which that tax existed. Accrual accounting is what companies use to report their earnings and income statements each quarter. Accrual accounting spreads out expenses and income so that monthly variations are rather small. The reason we cover this is so that you can choose which form of accounting you want to apply to your personal budget. If you like accruals, then our traditional budget is best, if you like cash accounting, then our monthly budget is a better fit. Below, we'll discuss the differences and give you information on how to download an excel version of each. First of all, it makes a lot of sense to create a monthly budget spreadsheet that you can use to track your month to month expenses. In our traditional budget spreadsheet we estimate an average monthly budget based on both monthly and full year expenses. In other words, you input each monthly expense and each annual expense. The annual expenses are divided by twelve and then put in the monthly column, and the monthly expenses are multiplied by twelve and put in the annual column. The end result is really a hypothetical monthly budget. You could also look at it as a type of accrual method budget, as it accounts for annual expenses over the entire year rather than when they are incurred. The reason to use this type of analysis is to get an overall picture of how much money you should be saving, on average, each month and year. If you are interested in doing this type of analysis, please download our traditional household budget spreadsheet. If you are interested in a monthly approach to budgeting, then read on. 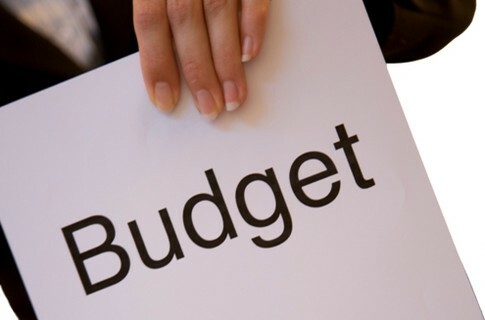 While using our traditional budget to get a good estimate of your finances is no doubt a great tool in your financial arsenal, it is an even better approach if you track the actual expenses each month and run your budget on a cash basis. By recording actual expenses month after month, it not only gives you actual figures for your budget, it also keeps you involved for the long run. By filling out this type of budget each month and measuring the changes, you'll be able to get a good picture of where your money is really being spent, and you'll be able to see which months that you'll need to have money saved for. Typically, December is the biggest deficit month for most people because of year end expenses, annual property taxes and insurance renewals, and of course, all of the holiday spending. That means that you'll need to make sure that the rest of your monthly budget surpluses make up for any deficits that you may have. And, of course, you'll need to make sure that you save enough money from your good months to make up for your bad. And if you're really serious about saving money, you can use this monthly budget worksheet to really cut down on your expenses over the next few months and years. Once you've got the template, it's pretty self explanatory as to how to fill it in. Track your actual expenses each and every day, or compile them at the end of each week or month. Then, fill in each row in the spreadsheet. If you want to break the categories into more detail, or add notes, you'll need to be familiar with how spreadsheets work. The important thing is that you account for every dollar each month. For example, if you fill in your budget for the first month and then add up the surplus and it says that you should have saved $300, then you should have $300 in your account. If you don't, then you missed something on your budget and you'll have to go through your expenses to try to figure out what is missing from the template. In a way, it's similar to balancing a checkbook. There is a specific figure for your income and your expenses, and matching them all together can be challenging, but when you're done, the numbers must add up. Now, go do some budgeting, and good luck!